Let’s build an automated archaeologist! It is not an easy task. We need a highly complex, nonlinear, and parallel information-processing “cognitive core” able to explain what the robot sees, in terms of causal factors, which not always have an observable nature. Of course, such a “cognitive core” should not run like a human brain. After all, automated archaeologists do the same tasks as “human archaeologists,” but not necessary in the same way. Nevertheless, there is some similitude in the basic mechanism. 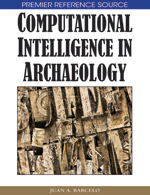 My suggestion is that an archaeologist, human or “artificial,” will perceive archaeological data and, using some basic principles of learning, as those presented in previous chapter, will develop ways of encoding these data to make sense of perceived world. Consequently, we may try to build our artificial archaeologist based on the idea of learning and the ability to adapt flexibly epistemic actions to different archaeological problems waiting for a solution. Let’s build an automated archaeologist! It is not an easy task. We need a highly complex, nonlinear, and parallel information-processing “cognitive core” able to explain what the robot sees, in terms of causal factors, which not always have an observable nature. Of course, such a “cognitive core” should not run like a human brain. After all, automated archaeologists do the same tasks as “human archaeologists,” but not necessary in the same way. Nevertheless, there is some similitude in the basic mechanism. My suggestion is that an archaeologist, human or “artificial,” will perceive archaeological data and, using some basic principles of learning, as those presented in previous chapter, will develop ways of encoding these data to make sense of perceived world. Consequently, we may try to build our artificial archaeologist based on the idea of learning and the ability to adapt flexibly epistemic actions to different archaeological problems waiting for a solution. How much should be programmed in its final form into such a cognitive core and how much will have to be learnt by interacting with some environment, including teachers and other agents? Projects aiming to develop intelligent systems on the basis of powerful and general learning mechanisms start from something close to a “Tabula rasa,” however, they risk being defeated by explosive search spaces requiring evolutionary time-scales for success. Biological evolution enables animals to avoid this problem by providing large amounts of “innate“ information in the genomes of all species. In the case of humans, this seems to include meta-level information about what kinds of things are good to learn, helping to drive the learning processes as well as specific mechanisms, forms of representation, and architectures to enable them to work. Is it possible to use these ideas for building an “intelligent” machine? Like its human counterpart, the cognitive core of our automated archaeologist should be made of specialized cells called neurons (Figure 1). Artificial and biological neurons are relatively similar, and both have the same parts, also called the cell body, axon, synapse, and dendrite (Bechtel & Abrahamson, 1991; Dawson, 2004; Ellis & Humphreys, 1999; O’Reilly & Munakata, 2000; Quinlan, 1991). Each neuron connects as well as accepts connections from many other neurons, configuring a network of neurons. Those connections are implemented by means of dendrites, while synapses are a gateway linked to dendrites coming from other neurons.